TORONTO , Jan. 22, 2019 /CNW/ - Continental Gold Inc. (TSX:CNL; OTCQX:CGOOF) ("Continental" or the "Company") is pleased to announce additional high-grade assay results from fifteen holes drilled into the Veta Sur system as part of the exploration drilling program at its 100%-owned Buriticá project in Antioquia, Colombia . The Company presently has six underground definition drill rigs operating and anticipates adding up to three exploration rigs, with the first one expected to arrive in February 2019 . As previously announced, the Company plans to drill up to 73,500 metres in 2019, consisting of approximately 55,000 metres of capitalized definition drilling and approximately 18,500 metres of exploration-led infill drilling. Supporting documentation for results discussed in this release can be found in Table 1 and Figures 1, 2 and 3. Numerous assay results from the 2018 program are pending, including those testing Broad Mineralized Zone 1 ("BMZ1") and the recently announced new BMZ2 discovery. Additionally, results are pending from a series of follow-up holes for a potentially new broad mineralized zone located approximately 150 metres west of BMZ1 in the Yaraguá system. 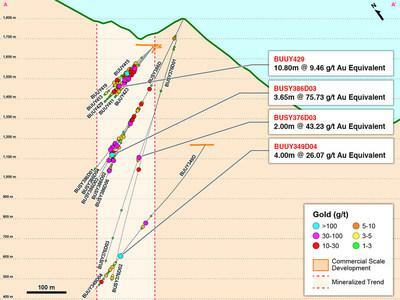 The Company had previously announced assay results for one drill-hole testing this potential new target, which assayed high-grade gold averaging 37.55 metres @ 7.92 g/t gold and 8.7 g/t silver (DYR0050, 1,460-metre elevation) (see press release dated October 1, 2018 ). "The final drill holes for 2018 into Veta Sur continue to confirm the sheer scale of this high-grade system. Our technical team strongly believes that the Veta Sur system will continue to grow both along strike and at depth, with high-grade gold intercepted at the western and deepest vertical margins of the modelled vein envelopes," stated Ari Sussman , CEO.